Noise is the price we pay for volume and diversity of content. I’m hopeful that we can reap the rewards of the wealth of information around us, while minimising the price way pay having to filter through it to get to the good stuff. I’m interested in the task of focusing on relevant, helpful material and reducing the mental overhead of filtering out irrelevant material. In this post I look at one way to bring a bit of order and clarity to your RSS feed subscriptions, so that they are more focused and useful. To do this, we use Yahoo Pipes – an online tool that can manipulate information from around the web, and serve it to you in a range of formats. You can make your own pipes, and so create your own processes for gathering and manipulating information and content. Each pipe takes an input – or a range of inputs – does stuff with it – in some sort of sequence – and then presents an output. Data flows through pipes, gets processed appropriately at different points, and goes down to the output. You can then do stuff with this output – in our case we want to subscribe to it as an RSS feed. One very important area of digital change is SEO. Watching SEOmoz’s weekly Whiteboard Friday video is a great way to keep up-to-date with best practice, and to see experts figure out the implications of any changes in the search landscape. I’m not a dedicated SEO professional, though, so I don’t really have time to read all the posts on SEOmoz. But I do want to keep up with Whiteboard Fridays.The SEOmoz RSS feed doesn’t know this, of course, so it just serves me all the content produced on the site. 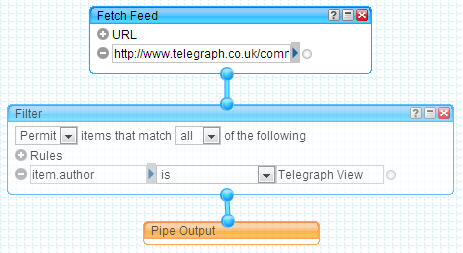 In the Pipe editor, click on the ‘Sources’ heading, then drag ‘Fetch Feed’ into the editing area. 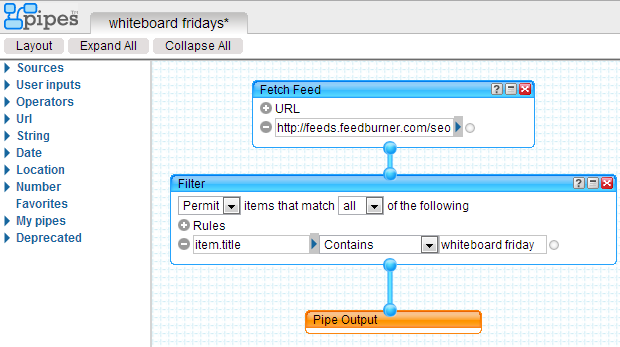 Now it’s time to add in a filter, and set it to only let through Whiteboard Fridays posts. Under the ‘Operators’ heading, grab the ‘Filter’ module. Now it’s time to specify the filter we want. This looks a little intimidating at first, but if you click on the left-hand column Yahoo Pipes makes some suggestions. In this case we want to the filter to only allow through content whose title contains ‘whiteboard friday’. Have a look at this pipe and make a copy of your own – or remix it! You can add multiple rules for each filter, which can give you lots of power. You could, for example, filter the NHS Choices Behind the Headlines feed so that you see material about ‘cancer’ or ‘dementia’ but nothing else. You can filter by more than item.title. You can also filter by item.description, which seems to be the item’s content, or at least an excerpt. Head over to yahoo pipes to see this pipe in action. But sometimes you know what you want from a given RSS feed, and you don’t want to see anything beyond that. Be in control of the noise – this is the time to filter. Save you brainpower for filtering through the noise in areas where you’d like to expand your knowledge and understanding beyond what you currently think you need to know. What is gamification and how might it be useful for charities?